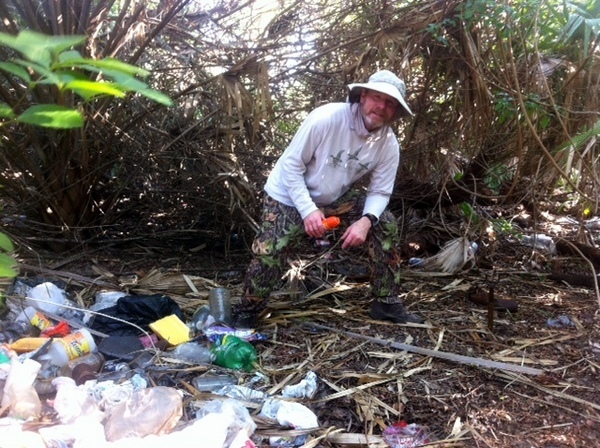 Trash removal at a homeless camp on the beach exposed the Ais Indian midden and artifacts beneath the rubbish! I showed up dressed in long pants, long sleeved shirt, hat, leather gloves and applied copious amounts of bug spray. My son emailed me to see if I wanted to help his group of well minded millennials clean up a beach side homeless camp. 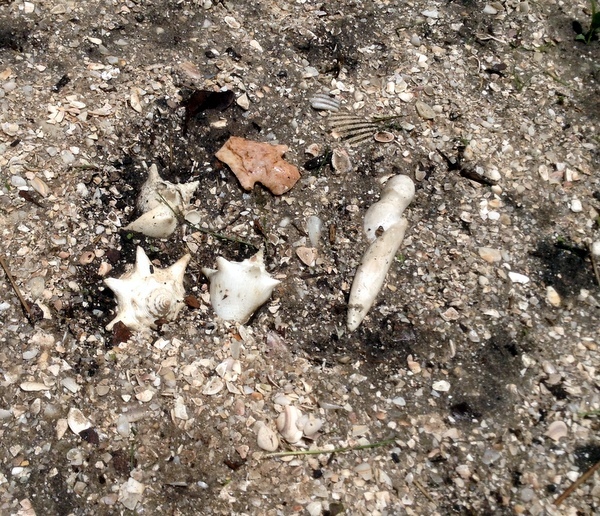 I had been searching events related to cleaning the Indian River Lagoon and this was sort of on the lagoon, -it was close to the river, on the barrier island between ocean and lagoon. Sure why not-I already was a volunteer at the space center to do similar civic events. Saturday morning I showed up early to "Paradise Beach Park" (somewhere between the communities of) Melbourne Beach and Satellite Beach - not sure because I live across the lagoon on the less crowded mainland. Showed up early to get a good parking spot and Brevard County employees had already parked a dump truck near the dense palmetto scrub homeless camp on the north end of the park. Have to say the Millennials get a bad reputation. As the volunteers and my son trickled in and garbage bags were dispersed; I dwelled on the fact that these folks had given up their Saturday to clean a park-not something I would have consideredat their age. While they excelled in the enthusiasm category it could be said they were however lacking in the environmental consideration of the task at hand. Myself an old hand at crawling through "saw palmettos" often just to see what was on the other side or on occasion to measure an Ais or Arawak shell middens: I came dressed in long pants, heavy boots, long sleeved shirt, hat, leather gloves and copious amounts of bug spray. I winced at the beach attire and sandals worn by most of the volunteers. Saw palmettos get their name from the sharp "hack saw" like teeth that easily slices exposed skin. Nevertheless, we were there to collect trash and that we did for next four hours. Despite the attire on some -we filled up that dump truck! We were warned to stay away from the "active" homeless camps and focus on the areas where the garbage was so thick even the homeless had to move to the next sand dune ridge. Why does a person move their home from one sand dune to the next? Perhaps I reflected they had to move to the next dune when the human waste became a "Step into" problem or perhaps the people that lived on one hill (dune) had passed away or moved north and new homeless took up residence on the less trashy dune. Under the modern trash were: pot shards (sherds? 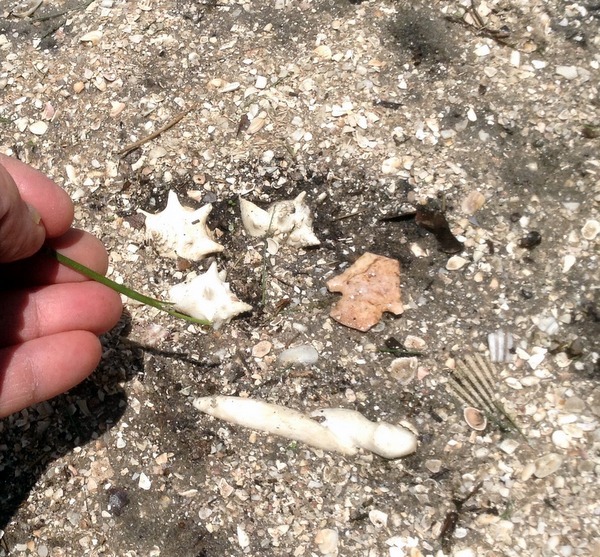 ), whelk shells and dark soil of human habitation. As mentioned we had been instructed to stay away from the active homeless areas (no confrontations over a broken lawn chair & so on) and began our "Clean the dunes" operation well north of the main park beginning at a narrow entrance right off of Highway A1A. The trash appeared to be about three years old and the beer bottles were two foot deep at the entrance. We filled at least a dozen bags just to clear our way a few steps into the bushes from the busy highway. After a few hours I comprehended we were cleaning a series of low vegetation covered dunes with stunted oak trees on the higher areas. 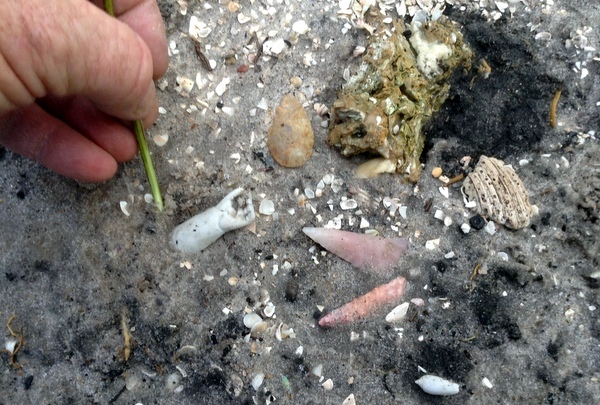 Modern trash covered the everything nearly a foot deep in most locations & under the trash were clams shells from the Indian River and ocean shell fish from the nearby surf; Ais Indian pottery shards stuck out in some places. Because of an over active imagination I began to explain to my fellow volunteers that we were in the area where one of the 1714 Plate Fleet treasure ships had come ashore. And only last year beach combers were still finding Spanish silver on the beach after the recent hurricanes. 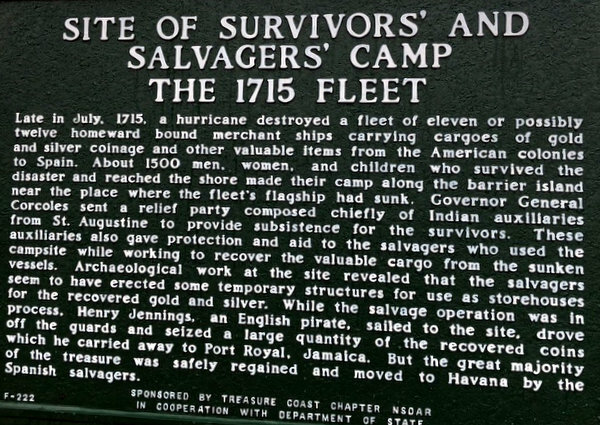 "We might be standing on one of the salvage sites were they collected treasure" I explained, and that 1100 people had survived the sinking of the treasure fleet. So that conversation lasted a good fifteen minutes before the subject matter at hand returned to their favorite sports heroes. I worked deeper into the brushy "the outer edges" because there were more old Ais Indian middens and less modern 'homeless' middens. The first "non pottery" artifact I found was a broken arrow head. Close by was a shell pendant or net weight. I took photos, and very strongly considered pocketing the two items. Still I was fairly elated: doing my civic duty and finding two artifacts! That is called a "Good Day"
On the next dune i stopped and listened; there were voices somewhere ahead and I heard a sharp bark of laughter. Time to turn around I thought and as I pivoted I saw as tiny tiny hand in the sand. I squatted to inspect the hand and arm-a tiny child's toy. Ceramic? And next to were three small arrowheads! I snapped a few photos and sat down-my legs were wobbly and like rubber bands by this time. Take them or leave the arrowheads? The toy hand while cool did not attract my attention like the two triangle shaped arrowheads and a round bottom arrowhead. I could hear the laughter again over the roaring noise in my head (my cuss words omitted) I really wanted to take the arrowheads but I had already set a precedent to leave the items to the pros. And so rather disgusted with myself, "For taking photos only" I stood up on sore legs, leaving the artifacts in place and went to find my son to call it a day. Nearly every day, I dwell on the question, was the childs toy something from the great treasure wreck or something later in Florida's history? I am hoping one of the professionals will be able to answer that question some day. Final note: Would I go back, if they do another Homeless camp clean up?